A Service Activity is a business operation, such as Replacement or Return for Repair. 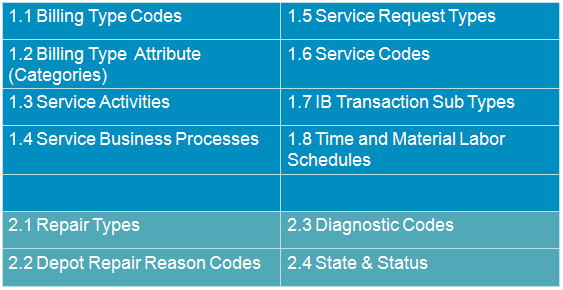 Each Service Activity is classified as either an Order or a Return - this is specified by its Line Category. 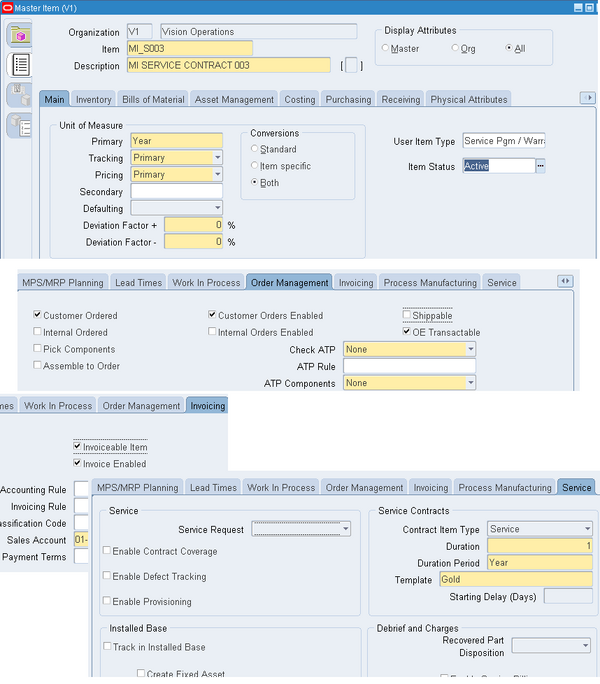 A Service Activity has a one to many relationship with Service Activity Billing Type. A Service Activity Billing Type, for example, Advanced Exchange: Material, is an intersection between Service Activity Advanced Exchange and Billing Type Material. window. The seeded Billing Categories include Material, Labor, and Expense. 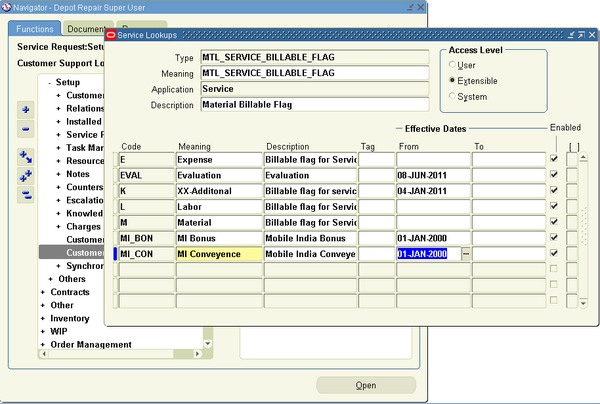 Only the Billing Types associated with a Billing Category in this window appear in the Billing Type Name List of Values in the Service Activities and Billing Types form. Similarly only the Billing Type Names associated here appear in the List of Values for Billing Type: Material, Labor, and Expense in the Repair Types form. Every item to be processed using Charges must be set up in Inventory as a Material, Labor, or Expense (MLE) item. This means every item in Oracle Applications that may need repair must be set up as a Charges MLE item. 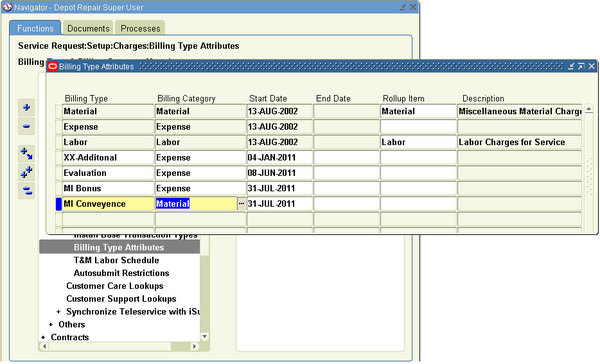 Billing Categories classify Billing Types into Material, Labor, and Expense. 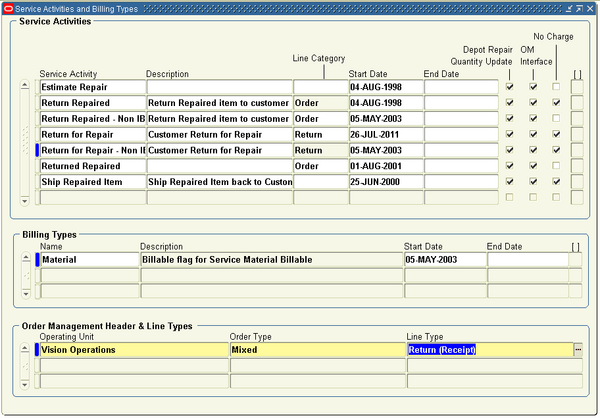 Each serviceable item in Inventory is classified using Billing Type Codes associated to a Billing Category. Setting up Oracle Depot Repair includes setting up related Oracle applications, such as Oracle Inventory and Oracle Installed Base. In setting up these applications, you might only need to make Depot Repair specific modifications to existing data, like existing items. Check with your implementation team to determine which setup requirements have already been fulfilled. 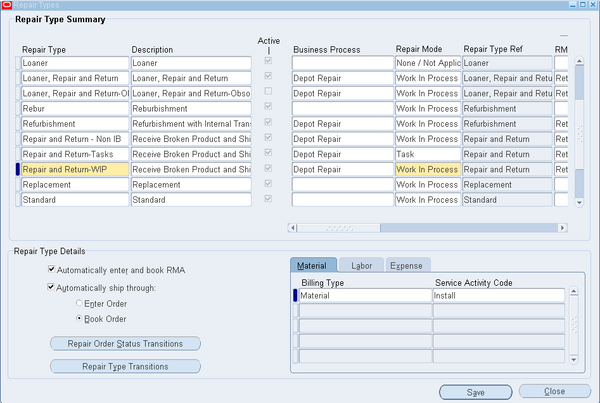 Oracle Depot Repair provides the similar functionalities as order type (line type) in order management or transaction type in account receivables. Repair Types help to classify the Repair Order and determine the repair management processes and logistics to fulfill the repair process. These repair types enable service providers to be more efficient in managing the repair through process automation. 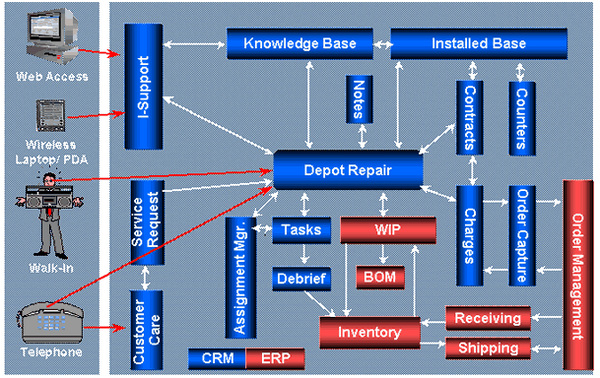 Oracle Depot Repair is part of the Oracle E-Business Suite and offers an enterprise-wide solution for managing depot repair processing. It targets the repair business market from simple, quick repairs to routine maintenance. Oracle Depot Repair integrates with other Oracle E-Business Suite modules to provide an integrated comprehensive solution for the repair business sector. assumed to be included in the price of the associated product. You must define warranty items in the item master. 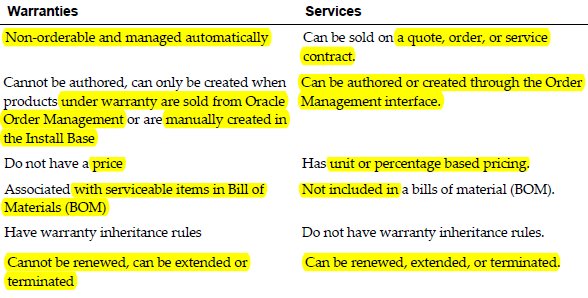 Warranties cannot be authored like a service contract, can only be created when products under warranty are sold from Oracle Order Management or are manually created in the Install Base. Extended Notebook PC Service Plan. 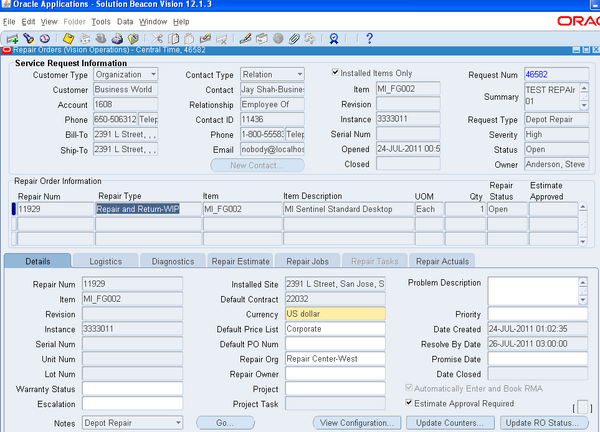 After creation of the invoice, run the program 'Service Contracts Fetch Receivables Info for Billing Program'. This program updates the customer's contract with the AR invoice information. The invoice number and tax appear in the billing details. Few basic invoice information (with out the invoice number) like amount and date appears in contract even before running this program. The basic payment information also appears in contact before running this program.